Let's be real here for a second - if Chris Moneymaker doesn't win the 2003 World Series of Poker, then there is a very good chance that you wouldn't be playing online poker right now. If Chris Moneymaker doesn't navigate through a field of 839 players to take down the $2.5 million first place prize at the 2003 World Series of Poker, then there is a very good chance that you wouldn't be playing online poker right now. If Sam Farha or Dan Harrington or Tomer Benvenisti or Amir Vahedi win the 2003 World Series of Poker instead of Chris Moneymaker, then there is a very good chance that you wouldn't be playing online poker right now. ..then there is a very good chance that you wouldn't be playing online poker right now. If Chris Moneymaker doesn't win a $39 satellite on Pokerstars to qualify for an even bigger WSOP satellite, then there is a very good chance that you wouldn't be playing online poker right now. If Chris Moneymaker doesn't win his WSOP main event seat in this bigger Pokerstars satellite, then there is a very good chance that you wouldn't be playing online poker right now. Chris Moneymaker's win at the 2003 World Series of Poker was the key catalyst behind the "online poker boom" of the past seven or eight years. Online poker was fairly new back in 2003. Many people didn't realize that they could play poker from the comfort of their own homes, rather than in Las Vegas casinos or seedy underground games. Chris Moneymaker had parlayed just $39 of his own money into millions of dollars virtually overnight, and this captured the attention of the entire world. As mentioned, Moneymaker wasn't a professional poker player, which made his win even more remarkable in 2003. He was an accountant by trade, having graduated from the University of Tennessee with a master's degree in accounting. At the time of his big win in 2003, Moneymaker was a comptroller and also a part-time employee of a local restaurant. Moneymaker wasn't spending 15 hours per day grinding multiple tables online - instead, he had a job (multiple jobs actually) and other responsibilities. He was a true poker amateur. Moneymaker's amateur status was painfully obvious during his run to the 2003 World Series of Poker final table. He often made mistakes, betting and checking out of turn. In the end, Moneymaker certainly caught some lucky breaks en route to his victory, but he also likely benefited from the fact that his opponents didn't think much of his game. The final heads-up battle in the 2003 World Series of Poker just further highlighted the "amateur vs professional" theme that was prevalent during that year's main event. In one corner you had Chris Moneymaker, the pudgy accountant with barely any poker experience, especially in a "live" tournament environment. In the other corner you had Sam Farha, who basically was a living caricature of a professional gambler - a smooth-talking player with slicked-back hair and an unlit cigarette dangling from his mouth. Chris Moneymaker, and by extension Pokerstars, received a great deal of mainstream exposure after the 2003 World Series of Poker main event. Moneymaker did a number of interviews following his win, including an appearance on the Tonight Show with Jay Leno. People were obviously intrigued by Moneymaker's story, and started signing up at online sites such as Party Poker and Pokerstars by the millions. The "online poker boom" had begun, sparked by the "Moneymaker Effect". 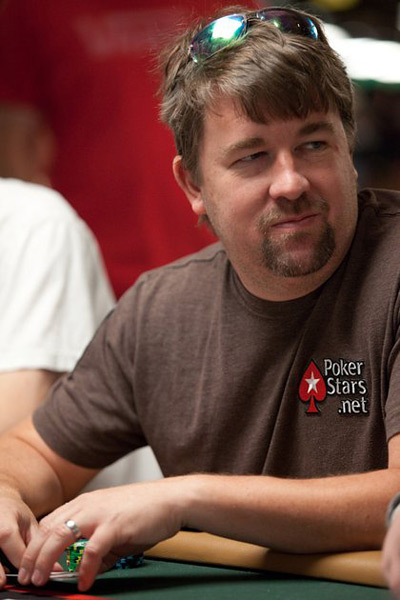 Pokerstars wisely decided to ink Chris Moneymaker to a sponsorship deal. This was before the days of "Team Full Tilt" and "Team Pokerstars Pro" - the sponsorship deal that Moneymaker signed with Pokerstars was one of the first of its kind. Less than a decade later, hundreds upon hundreds of poker players have sponsorship deals with online poker sites. In addition to his deal with Pokerstars, Moneymaker also signed a deal to serve as a "celebrity spokesman" for Harrah's Entertainment following his big win. Roughly seven months after taking down the 2003 World Series of Poker for $2,500,000, Moneymaker had his second big score, a second place finish in the 2004 Bay 101 Shooting Stars event for $200,000. Moneymaker would end up losing out to Phil Gordon (one of the members of "Team Full Tilt") during heads-up play. This would be Chris Moneymaker's last six-figure cash in a "live" tournament event until January of 2011, when he finished in 11th place in the 2011 PCA main event for $130,000. Chris Moneymaker, under his "Money800" alias, has done well for himself in a number of high-profile tournaments on Pokerstars. In September of 2008, Chris Moneymaker finished in sixth place in the WCOOP $10,300 "High Roller" event for $140k. In May of 2010, Moneymaker finished in 3rd place in the SCOOP $1,050 PLO (1R1A) for $55,257. In September of 2005, Moneymaker finished in 3rd place in WCOOP #12 ($530 Seven-Card Stud Hi-Lo) for $25,497.80. Chris Moneymaker seems to be in a good place in his life. Moneymaker doesn't spend too much of his time traveling the poker circuit, but that seems to be just fine with him. Instead, he spends most of his time at home in Tennessee, enjoying life (golfing, playing basketball, etc) and spending time with his family. -published an autobiography in March of 2005 titled "Moneymaker: How an Amateur Poker Player Turned $40 into $2.5 Million at the World Series of Poker"
Chris Moneymaker is still a member of "Team Pokerstars Pro", nearly eight years after his monumental win in 2003. The next time you fire up your online poker software and sit down to a game, you might want to give a little thanks to Chris Moneymaker.